We had some beautiful weather last month, and since that doesn’t usually last very long I tried to make the most of it. 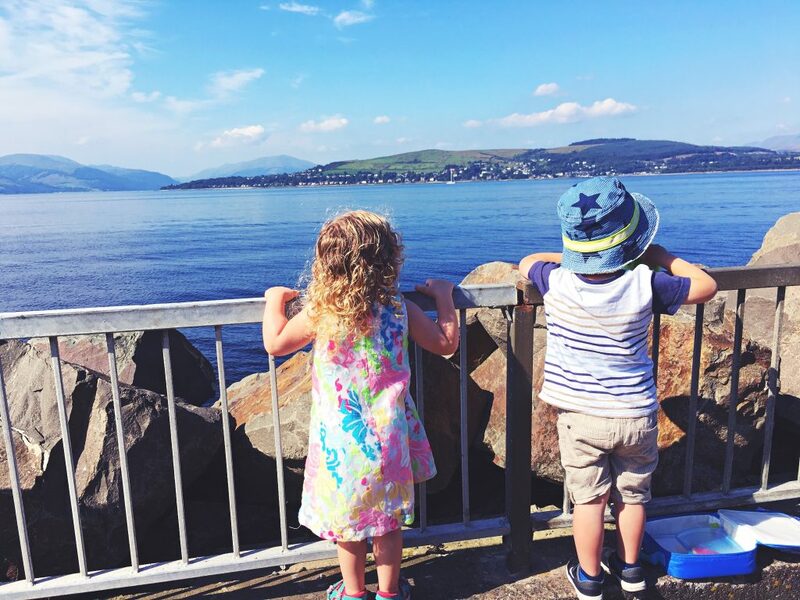 One of the little day trips we went on was to check out Gourock Outdoor Pool, along with one of our lovely mummy and toddler friends. 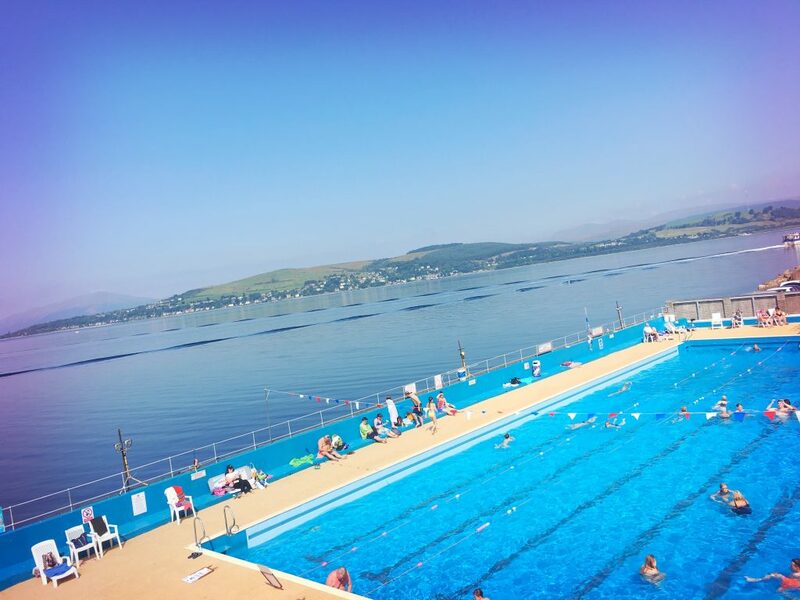 The pool and car park is right on the coast of the Clyde Estuary, and is particularly pretty! Good for some boat watching too. There are two pools. The small pool is deep enough for little ones to float around in. The little lady could both walk and swim in it. It must’ve been about 2 ft deep. The bigger pool had a few lanes for swimming, plus a large area for playing/some less serious swimming. Non-swimmers are allowed in the shallower end so we stayed up there. There’s also a springboard and a dive platform at the deep end of the pool that are opened every so often, and the deepest part of the pool cordoned off for the brave to jump in. The terrace area surrounding the pool has lots of seating and some sun loungers. We took a little bag of toys and floats out there with us, but there were quite a lot of pool noodles already int he pool. There is also a patio area up the stairs where you can sit and enjoy the view out over the Clyde Estuary. We managed to choose a beautifully sunny day when we went along which definitely made our experience very enjoyable. However the water in the pool is heated to a balmy 29°, so I think it would’ve been pretty nice to be in the water even if it wasn’t such a summery day. The only time you’d be cold is if you wanted to get between pools or back into the change rooms. The change rooms were clean. The showers were warm. And there were plenty of cubicles and lockers. Adults cost £4, juniors are £3.40. It only cost £4 though for me and the little lady so under 3’s are definitely free. I didn’t think to ask at the time at what age that changes. Apologies! There is a car park just outside the pool. It’s free for the first 3 hours but after that it’s pay & display. I’m not sure what the rate is though as we were back at the car within the 3 hour limit. It’s an outdoor, open air pool, and so there were some bugs floating around here and there. But not nearly as many as I’d expected. Kids aren’t likely to gulp the water (and hence bugs) anyway since its saltwater and really not very tasty. 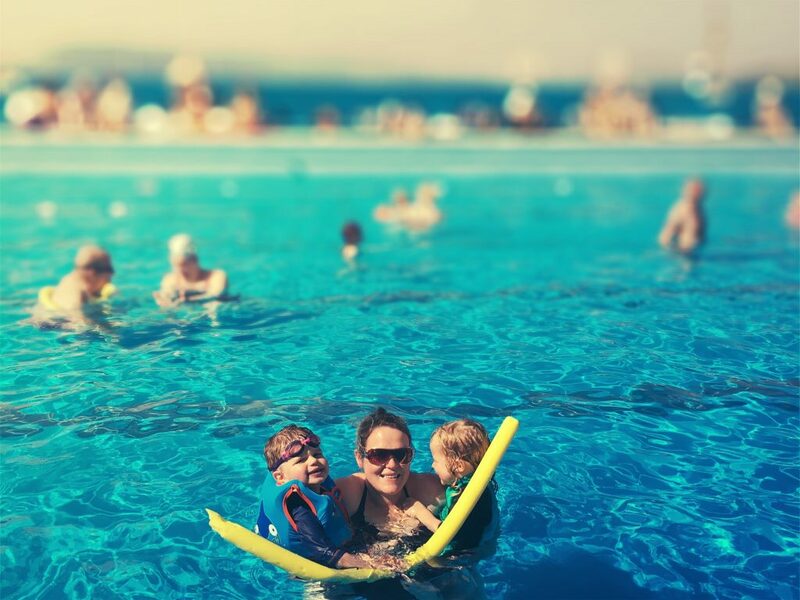 The pool isn’t open year round – it’s only open seasonally during the summer months. I’d recommend having a look at the website before you go and check whether it is open or not. I’ve been told that they do midnight swims on selected evenings throughout the summer, and also some beginners kayak lessons too. Worth checking out if it’s something you or your bigger kids might enjoy! 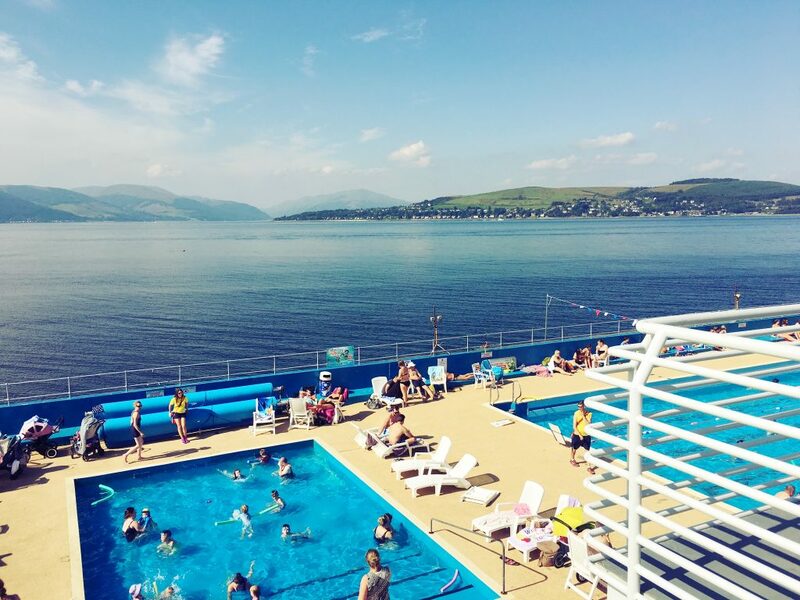 We had a fantastic time at Gourock Outdoor Pool. It’s clean and safe with lots of lifeguards around. The saltwater was a bit strange for the little lady. Her rather loud exclamations of “Uugh, that’s disgusting! !” loudly, in the most Glaswegian accent ever, got less frequent after the first few times she jumped in. The little lady really enjoyed it, as did her toddler friend. I really enjoyed it too. It was lovely to be able enjoy an outdoor pool in Scotland. We’ll definitely be back next season! 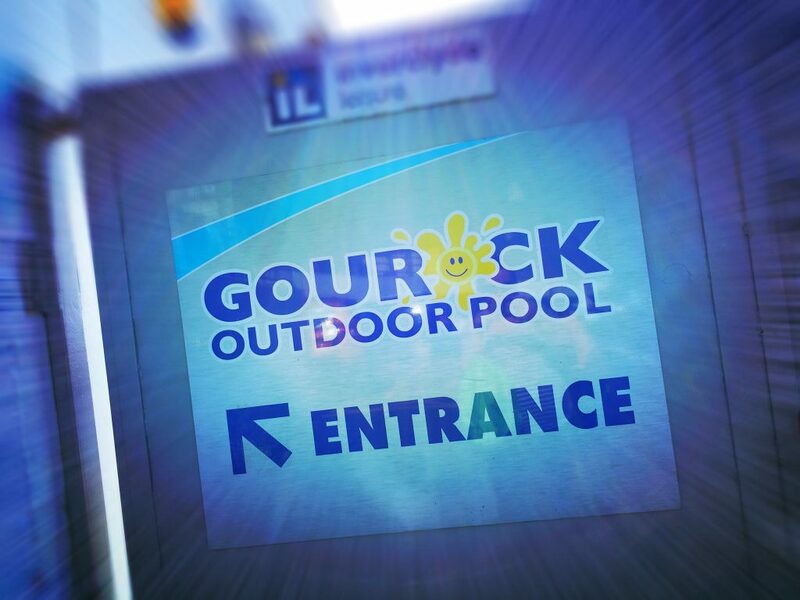 Gourock Outdoor Pool is located on Albert Road, Gourock, PA19 1NQ. It is open daily during the summer months. In 2017 it will be open from May to September. Pregnancy update: 40 weeks! Due date is here.